A Police Clearance Certificate is a legal Certificate issued by police or government authority of a country to list any criminal records that the applicant may or may not have. PCC are used by Citizens and Immigration to prevent individuals who possess a risk to Country's security from entering the country. Good Standing certificates are different in each country and in UAE it is known as Police Clearance Certificate UAE. A Good Standing certificate is a copy of your criminal record or a declaration of the absence of any criminal record. Criminal records may include arrest, conviction, and possible criminal proceedings. 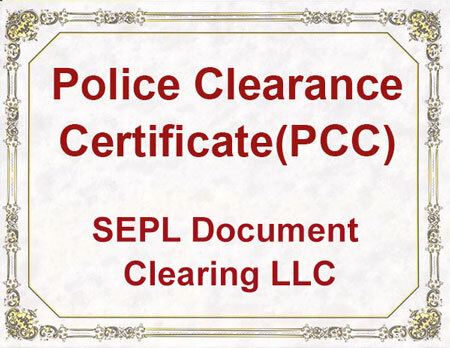 We at SEPL Docuemnt Clearing LLC provide you best services for Dubai police Clearance certificate. If you want to immigrate to Australia, New Zealand, South Africa, UK, USA, Canada, India, etc., you and your dependants might have to give good standing certificates when submitting your application for permanent residence. SEPL Docuemnt Clearing LLC provides services related to immigration and help our clients in obtaining Good Standing Certificate UAE (PCC) from origin countries. How to Apply for UAE Police Clearance Certificate? Dubai Police Clearance Certificate (Good Conduct Certificate) is issued by Criminal Investigation Department (CID) of Police. It is required to get Employment Visa in Government and Semi-Government Departments, Banks, Major Companies, to apply for PRO Card and to migrate to other Countries, etc. Applicants may have to submit fingerprints and certain personal information to request a Dubai Police criminal record check. If no record found, the police certificate will indicate such. Dubai Police Clearance Certificate (PCC) is issued on the basis of an unmistakably clear Police Verification Report received in respect of the passport held by the applicant. Police Clearance Certificate can be obtained from Dubai Police within 2-3 working days for residents within the country. To obtain Permanent Address in other country. Obtaining entry visa for certain countries.